Yes it’s a few days after Valentine’s Day, but I wanted to share our sweet dessert with you all. Travel Man was lucky enough to be home for this Valentine’s Day, and cooked me a great dinner that included steak, shrimp, au gratin potatoes, and green beans. A yummy treat. The food was great, and I’m sure tasted so good because I took a back seat in the kitchen. Travel Man made the dinner, and I made the dessert. A great team effort. Our dessert was some brownies I baked from a box mix. I watched the pan carefully while it was baking because I wanted the brownies to turn out extra ooey and gooey. And they did. I made these in the morning right after breakfast so they had plenty of time to be completely cooled. 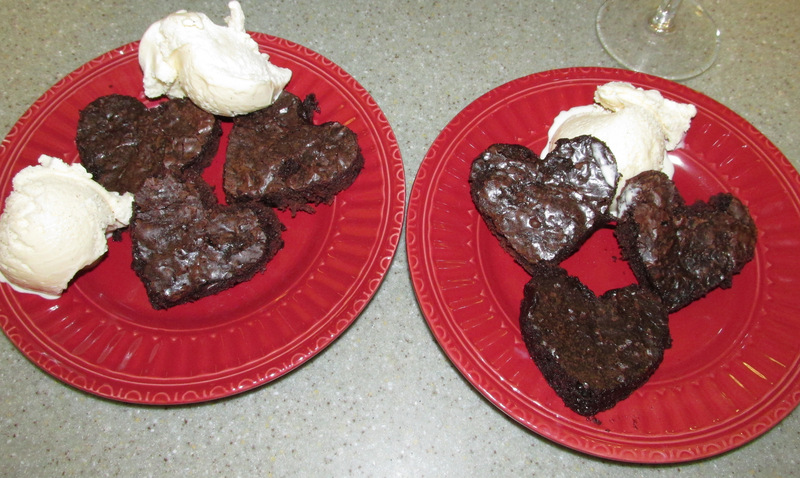 For serving, I dug out my little heart-shaped cookie cutter and sculpted the brownies that you see here on the plates. Then we added some creamy, delicious, french vanilla ice cream, and enjoyed a sweet dessert feast. Just a simple little dessert made with love, and lots of chocolatey goodness. Did you bake any special treats for your Valentine? That’s a really pretty dessert – it looks delicious! Thanks Meg. It was chocolicious!! Thanks for stopping by.